Sony NEX-6 review – The logical CSC choice? The aim of the NEX-6 is to offer customers the performance of a DSLR in a compact system camera body. Compared to the NEX-5R below it, the NEX-6 provides an OLED electronic viewfinder (EVF) with 2.359k dots and a useful built-in flash with a Guide Number of 6, to help when you need a little extra light. The viewfinder is the same as the one found on the NEX-7 model and it saves you having to rely on the LCD screen when taking pictures or reviewing what you’ve captured. While the camera is provided with an external flash as well, having a built-in flash means you can leave the external flash at home when you think you won’t need it, helping to keep the kit bag that bit smaller. Since the camera aims to be all things to all photographers, there is a plethora of options available to keep every type of photographer happy. With the same 16megapixel Exmor APS-C CMOS sensor as found in the NEX-5N and the Sony SLT-A57, image quality is expected to be high and the ISO range from 100 to 25,600 points to the potential for good performance in low-light situations as well. Providing a range of shooting functions is important for a camera at this level and the NEX-6 does not disappoint. Alongside the advanced exposure modes of Program, Aperture Priority, Shutter Priority and Manual, there is also the familiar Superior Auto Mode. This offers settings for HDR, backlighting, hand-held night photos and sunsets among others. In addition though, there is a platform called “PlayMemories Camera Apps”. With the growth of photo apps on smartphones, this is a clever move by Sony as it allows you to install apps on your camera to offer additional features. Some of the apps are concerned with processing your images on the camera to add effects like miniatures, toy camera and pastel, but others add features useful at the point of taking pictures. Bracket Pro, a $5 purchase, adds bracketing functions where the shutter speed, aperture and flash power can be adjusted to bracket exposure. Equally, there is a focus bracket option to make getting the correct focus, or creating focus stacked images easier. Other apps add features like photo retouching on the camera, provide timelapse functions or open up the option for smartphone control of your NEX-6. This last function is enabled by another useful feature on the NEX-6 – the inclusion of built-in WiFi functionality. With the growth of photo sharing sites, the built-in WiFi function makes it quick and simple to share your images directly with a smartphone, tablet or computer and so upload them to the internet, all without having to download the images from your memory card first. For those photographers looking to shoot moving subjects as well as those that are static, the NEX-6 also provides a maximum frame rate of up to 10 frames per second. This is on par with the best DSLR cameras currently available and with up to 99 AF points available depending on the focus mode chosen, there is little reason to miss the shot. 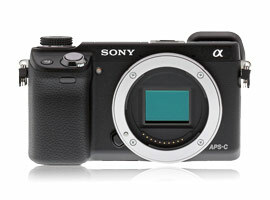 As with the Sony NEX-5R, the sensor itself features integrated phase detection AF sensors to provide improved AF tracking when shooting movies. This is a big step forwards and will help videographers improve the quality of their films. In use, the top PASM dial makes mode selections easier and while the screen is not a touchscreen, the menus are typically Sony and therefore easy to move around with a little practice. There are only a few buttons on the body as well keeping it simple for beginners while providing quick access to the advanced functions required by more advanced shooters. In fact, looking at the specifications of the NEX-6, there is only really one potentially negative point and that’s the rear LCD screen. While it tilts to make waist-level photography easier, it doesn’t fully articulate so is no use if you choose to shoot vertically. Whether this is an issue for you or not, depends on how you like to shoot, but it’s not going to affect the quality of the images. That is down to the sensor, so let’s take a look at the measurements. An overall score of 78 puts the NEX-6 into 26th place in the DxOMark list. This is just fractionally above the NEX-5R, which is unsurprising as they use exactly the same sensor. The score places it ahead of the Sony SLT-A57, Sony’s DSLR using the same sensor, as well as 11 places in front of Canon’s EOS-1D Mark IV. It’s also a clear 12 places above the Fujifilm X100 – one of our reference cameras. Like the Sony NEX-5R and NEX-5N, the NEX-6 scores 23.7 bits for color depth, again highlighting the fact that the sensors are the same in all three models. A score of 13.1EV for Dynamic Range is again no surprise, as it is equal to the NEX-5R. While this is a respectable score, it does fall a little way behind other cameras using the same sensor – the Nikon D5100 and D7000 for example, which score 13.6 and 13.9EV respectively. The score does show a minor improvement of 1/3EV compared to the NEX-5N, however this difference is unlikely to be visible in final prints. Looking at the low-light sensitivity, the Sony NEX-6 scores 1018 ISO, an improvement in absolute terms on the 910 ISO scored by the NEX-5R, but still below the Nikon D5100 that scored 1183 ISO with the same sensor. However, although these figures may seem like a large difference, it is actually less than 1/3EV. Like the difference in Dynamic Range, this is unlikely to be obvious in final prints. Comparing the Sony NEX-6 with the NEX-5R and NEX-5N shows the similarities in terms of performance between the three stable-mates. With the same sensor being used in all three models, it is understandable that the performance across the board is almost identical. The only difference is the fractionally improved dynamic range (1/3EV) when comparing the NEX-6 with the NEX-5N. Comparing the NEX-6 with the Olympus OM-D E-M5 is arguably more interesting than looking at the NEX-6 relative to other models in its own range, as the OM-D E-M5 uses a 4:3 sensor rather than an APS-C sensor as found in the NEX-6. The OM-D E-M5 from Olympus has a much improved sensor compared to its predecessors and in fact shows a 4:3 sensor that performs almost as well as sensors found in APS-C sensor compacts. The overall scores may suggest that the Sony NEX-6 (Score: 78) is quite a bit ahead of the OM-D E-M5 (Score: 71). However, looking at the scores in detail we can see where these differences appear and that in real terms, the cameras are very closely matched. Taking the score for Color Depth, the NEX-6 performs 1/2stop better (23.7 vs 22.8 bits) and in Dynamic Range the NEX-6 is 2/3stop better (13.1EV vs 12.3EV). The low light scores are close enough (less than 1/3stop) to be considered equivalent. However, when looking at the scores where there are differences, we need to consider the ISO range of the NEX-6 relative to the OM-D E-M5. Crucially, the NEX-6 ISO range extends down to ISO 100, whereas the OM-D E-M5 stops at ISO 200. It is this difference that accounts for the better scores for the NEX-6 in both Dynamic Range and Color Depth. The Dynamic Range graph shows that the NEX-6 and Olympus OM-D E-M5 are very closely matched in performance, with the only real difference being the lower ISO limit of the NEX-6 (ISO 100) compared to OM-D E-M5 (ISO 200). This accounts for the 2/3EV difference between the two cameras. Comparing the latest NEX-6 to the older Panasonic DMC G5 may seem unfair, but it is illustrative of how well the APS-C sensor in the NEX-6 performs relative to the older designed 4:3 sensor found in the Panasonic compact hybrid cameras. Looking at Color Depth, the NEX-6 outperforms the G5 by 1.5EV producing smoother toned images with finer colour gradations. It’s the same story with the dynamic range, an improvement of 1.5EV (13.1EV vs 11.6EV) allowing for a greater contrast range to be captured before shadows block up or highlights blow out. Compared to the DMC G5, it makes the NEX6 a better choice for landscapes where the dynamic range performance is more important. The ISO performance is another plus for the NEX-6, with a half stop (0.5EV) improvement for better images in low light conditions (1018 ISO vs 618 ISO). The Sony NEX-6 shows a marked improvement over the Panasonic DMC G5 throughout the ISO range. The additional exposure latitude makes the NEX-6 a better choice whatever subjects you shoot, but most especially with landscapes, where a good dynamic range is important. As expected, the Sony NEX-6 produces a strong performance, in its segment, on par with the other Sony models using the same sensor. The choice between the Sony NEX-6 and the NEX-5R will come down to budget and camera features rather than performance – if a built-in flash and electronic viewfinder is important to you, then the NEX-6 is the better choice. If not, then from a performance point of view, there is no perceptible difference between it and its cheaper brother the NEX-5R. When comparing the NEX-6 to competitor cameras, the ability to now lower the ISO sensitivity to ISO 100 is the main reason for the performance gain. Moving forwards, while Sony currently holds the performance high ground in the Compact System Camera arena, the Olympus OM-D and Pen models show that other manufacturers are catching up, even with the smaller 4:3 sensors that have traditionally performed less well.